Our international partner network has witnessed phenomenal growth over the last few years. Today, Emsisoft works hand in hand with thousands of partners in 119 countries around the globe to provide customers with the malware protection they need to keep their data safe. And today, selling Emsisoft solutions got even easier. Based on the invaluable feedback from our existing partners, we’ve completely redesigned our partner portal for improved workflow and greater efficiency, equipping our partners with the very best tools for selling Emsisoft products. You can now choose whether you wish to receive license renewal reminders 45 days prior to the license’s end. Reminder emails are bundled for all licenses that are about to expire within the same day. Great news: we streamlined our checkout so double logins are no longer required to buy a product. 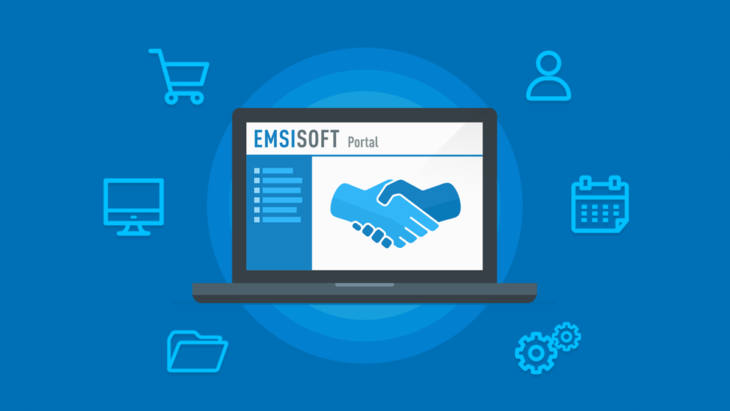 You can now also bundle multiple Emsisoft products in the same checkout process. Stock licensing options to buy 10+ licenses of a product in advance offer great discounts and streamline your internal workflow. Allows you see which seats are being actively used. Alerts you to licenses that are about to expire soon. Suggests you investigate if a customer’s malware protection has not been updated for a longer period of time. These features help you stay up to date about events that potentially threaten your customers’ security. New search and view filters allow you to locate keys that are most relevant for your sales activities, while flexible sorting functionality among all data tables helps you to quickly navigate through your keys. The new “unassign” feature can be used to remove licenses from your partner account if you or your customers wish to do so. The redesigned order history panel shows all your past orders of new and renewed licenses and comes handy for monthly reports. Check out our extensive marketing resources that assist you to set Emsisoft products apart from competitor offerings. Product brochures, data sheets and Emsisoft’s brand assets are at your disposal from within the portal. For the upcoming months we have planned to introduce even more new features to help our partners sell Emsisoft products in their local markets. New functionality will be continuously added, so stay tuned! If you’re a managed service provider and not yet a member of the Emsisoft partner network, please sign up today! There is no minimum sales requirement to get started.